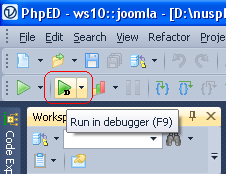 If you you have a project created in PhpED IDE and you use either 3rd party web server or SRV local WEB server shipped with PhpED or you want to debug with php cli executable, you can open PHP script that your want to debug in the editor and click Run in debugger (F9) button like shown on the screenshot. After debug session has finished and you got the page rendered in the browser, all subsequent clicks on the URLs or submit buttons will trigger debugger again. In most cases it's exactly what you need. Otherwise, just uncheck Run->Debug session and debugger will trigger only once. You can use Debugger Toolbar available for Internet Explorer browser. With this feature, you can navigate to the page you want to debug, and click Debug button on the toolbar. After debug session has finished and you got the page rendered in the browser, all subsequent clicks on the URLs or submit buttons will trigger debugger again. In most cases it's exactly what you need. 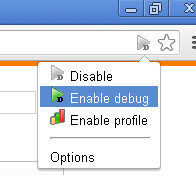 Otherwise, uncheck Run->Debug Session in PhpED or Debug Session checkbox in the toolbar menu and debugger will trigger only once. It's known that Debugger Toolbar maintained by 3rd party author is available for FireFox browser. Run PhpED, View->Launch Box. History of all "run with debugger" commands executed in the IDE is kept here. You can re-run any of them.